The historic kingdom of Flanders encompasses much of the northern part of Belgium. For centuries, the traditional beer of Flanders was a dark, sourish ale aged in oak casks at the brewery. Made from predominantly Pils or moderately kilned malts and some form of corn, with low hopping levels, many of the current examples exhibit a reddish hue. The name Flanders red ale or, more descriptively, Flanders acid ale denotes a beer that ferments with many more microorganisms than traditional brewers yeast. The most widely recognized example of the style is made by Brouwerij Rodenbach, in the town of Roeselare. Unlike most other beers, the byproducts of microorganisms that many brewers scrupulously avoid — including Lactobacillus, Pediococcus, Brettanomyces and Acetobacter — define the flavor and aroma of Flanders acid ales. Aged for up to three years in oak barrels, resident microorganisms produce acids and esters far different than traditional brewer’s yeast. Alone or in large concentration, these byproducts are not terribly appealing, but in the correct blend, they can compose a truly sublime beer. Often called the “Burgundies of Belgium,” largely due to the deep reddish-brown to burgundy color resembling a red wine, some of the typical, traditional flavors and aromas are reminiscent more of the grape than of the grain. A fruitiness resembling the flavors of black cherries, plums and red currants are typical, sometimes complemented by the spicy, vanilla character associated with oak. Tannins from the wood add a crisp, tart astringency and full mouthfeel. A characteristic tartness in both the flavor and aroma, due to both lactic and acetic acid, defines Flanders acid ales as reminiscent of red wine. Long aging with “wild” microorganisms leads to a beer of considerable acidity and attenuation. While not traditional, many of today’s Flanders style beers are pasteurized and blended with sugar or aspartame to restore sweetness and body. New Belgium Brewing (Fort Collins, Colorado) guards the body of their acid ale, La Folie, by centrifuging the beer before bottling. Alcohol levels hover around 6–6.5% alcohol by volume (ABV). Consistency in both alcohol, body and character is achieved by blending batches aged in multiple barrels. Traditional Flanders brewers often produce their beers from moderately kilned malts — especially Vienna and, to a lesser extent, Munich — and low alpha acid continental or British hops. Alter-nately, some breweries produce a wort made only from Pilsner malt and blend with a dark beer at bottling. Color aside, the pale brews also make for a tasty beer on their own. The traditional breweries guard the exact composition of their grain bill, and the specific malts used are tuned to the specifications of each brewery. What is commercially available must suffice to the homebrewer. Flanders acid ale brewers toss corn grits — up to 20% — into the mash, first boiled to achieve gelatinization. For homebrewers, flaked maize is a convenient alternative. Corn contributes a smoothness to the wort plus a bit of starch for the eventual microorganisms. While not common in Flanders, Wyeast Laboratories has found the use of unmalted wheat very beneficial. The starches found in unmalted wheat contribute more complex material than malted barley or corn that will also break down more slowly, providing fuel for the yeast and bacteria over a long period of fermentation. You can use up to 20% unmalted wheat in place of the corn. Hopping levels must be kept low, under 10 IBUs. An unpleasant combination, bitter and sour/acidic flavors are distasteful together. Additionally, hops have anti-bacterial properties and high hopping rates may inhibit some of the bacterial strains you want to grow in your beer. Continental hop varieties like Hallertauer are common, though American derivatives like Liberty or even Willamette will also suffice. Stay away from the more distinct grapefruity, piney American varieties, as their dominant character is out of place in a traditional Flanders beer. Unlike when brewing a lambic, you do use aged hops. One popular misconception regards the use of a long boil to darken the color of the brew. While some brewers in Flanders once boiled their worts for up to thirty hours, no current producer chooses to boil for longer than two hours. The marathon boil myth may have been proliferated at the Liefmans brewery. On their old brewing system, boiling the wort did take as long as twelve hours. The boiler was so inefficient, it took twelve hours to achieve what any reasonably modern brew kettle can do in about two. Flanders acid ales may be fermented with a pure strain of Saccharomyces yeast, relying on the resident wild yeasts and bacteria in oak barrels to acidify the beer over a period of up to three years. This will also darken it a bit from exposure to wood and oxygen. A production method best left to the true experts, the rest of us will use the no less traditional method of fermenting with a mixed culture of various yeasts and bacteria. Ferment the ale at typical ale fermentation temperatures, 68–72 °F (20–22 °C). The long conditioning can occur at cellar temperature. Higher temperatures favor bacterial action. The characteristics of traditional Flanders red ales develop during long aging in oak barrels, where resident microorganisms contribute more character than any actually derived from wood. Yeast and bacteria with different oxygen requirements all meet their individual nutritional requirements in the porous environment of a wooden barrel. Blending beers of different ages and colors balances the acidic character and produces a beer of reasonable if not identical consistency. A single batch seldom exhibits the complexity from a blend of multiple batches. The palate of the brewer determines the balance of the blend. The cousin of the Flanders acid ale, the lambic, shares a number of the same microorganisms. Pedicoccus and Brettan-omyces play important roles in fermentation. While the lambic brewer attempts to avoid naturally occurring Lactobacillus and Acetobacter, those microorganisms are very important to the traditional Flanders brewer. Simply put, Lactobacillus, Pediococ-cus and Acetobacter produce acids and corresponding esters. Their fermentation byproducts contribute the bulk of the flavor and aroma of a Flanders acid ale. Brettanomyces produces esters and a small amount of additional acids and also aids in attenuation. While most of these microorganisms are a part of the mixed culture of yeast and bacteria used for fermentation, Acetobacter is present in the environment — think of the smell of an unclean bar. Acetobacter will multiply when beer is left exposed to oxygen. Too much, and you will have vinegar, thus the importance of the porous nature of wood. Just the right amount of air passes through the wood to the liquid inside. Don’t have the space for a collection of wooden barrels around the house? Good news: a glass carboy works just fine. A plastic fermenter is actually too porous, while the amount of oxygen that seeps in through the airlock on top of a carboy and during periodic removal for sniffing and sampling is fairly adequate. Some type of wood in the fermenter is beneficial, be it chips, cubes or staves. Brettanomyces is partial to wood and some tannic and even flat out oak character is welcome. Be warned, though, a beer aged for years on new oak chips can turn undrinkable. While often used, boiling will not remove enough of the character of the wood. Exposure to alcohol leeches out compounds that water will not. Soak your chips in some neutral beer for a couple weeks before use. Once you have used oak in a Flanders acid ale, though, you can use it over and over, just like a barrel. Use about 1.0–2.0 ounces (28–57 g) of oak cubes per 5.0-gallon (19-L) batch. Barrels in Flanders contain all of the microorganisms necessary to acidify a beer. Unlike steel or glass, wood can never be completely sterilized, so any type of cleaning only removes the lazy critters on the surface, leaving behind what lives deeper. After a number of uses, a barrel is given a good cleaning and scraping, then aged beer is added to recondition the barrel with the proper microorganisms. Depending on what might live in the woody dregs of a previous homebrew batch on the bottom of a carboy is not a reliable option, which is why we use a new culture of yeast and bacteria each time we brew. The culture can be repitched, but acidity will increase with each generation until the result becomes oppressive. A brewer can choose to work with pure cultures of the microorganisms necessary for fermentation; the folks at Wyeast and White Labs offer individual cultures of all the needed microorganisms. My favorite culture, however, is the mixed culture Wyeast 3763 (Roeselare Blend), now a specialty strain not available year-round. While there are many factors, yeast and bacteria will grow in proportion, so adding one of each separately lends no discernable benefit. As commercial examples are either filtered or pasteurized, you won’t find any viable microorganisms in a bottle. A topic among itself, fruit may be added to a Flanders red ale, cherries and raspberries being the common choices. The flavors and aromas contributed by those fruits complement the characteristics of the beer. A beer is generally aged a minimum of six months before fruit is added to the fermenter. The beer must develop its own flavor before adding that of the fruit. Add fruit to your taste, but more than a pound per gallon of beer is common. Another disadvantage for the homebrewer is the lack of a supply of different aged batches of beer, at least at first. Simply put, a single batch seldom exhibits the complexity of a good blend. In Flanders, some brewers blend a bigger beer (OG 1.052), that has been aged in wood up to 3 years with a smaller beer (OG 1.044), that has only been aged for a couple months in stainless steel. The younger beer supplies some unfermented sugars and body to the blend. Blending does not achieve absolute consistency for a brewery, but most breweries strive to achieve a “signature” character in their beers through blending. That’s not to say, though, that you can’t produce an excellent beer in a single fermenter. Blending, too, is an art that takes time to master, so a single batch is more straightforward. Recently, I have taken to using only a portion of a batch and leaving a few gallons behind for the next bottling. Bottling a Flanders acid ale presents its own challenges. If you choose to blend, having a vessel big enough to hold parts of two or more batches is a necessity. Don’t use the same plastic bucket you may use for bottling other beer. You will likely never get rid of the Brettanomyces and lactic acid-producing bacteria from the porous plastic. Carbonation is a bigger issue in an acid beer than in your everyday IPA. The microorganisms that ferment the Flanders acid ale, even the ones that produce it, do not actually like acid. The higher the concentration of acid, the harder the microorganisms that produce carbon dioxide (CO2) must work. After many years of aging, use of a fresh yeast culture is essential. Choose a workhorse, like Wyeast 1007 (German Ale) or White Labs WLP001 (California Ale) yeast. Alternately, you can use a wine yeast that has a greater tolerance to acidity. Vinnie Cilurzo at Russian River Brewing uses a house wine yeast to bottle his wood-aged beers with great success. for the resulting dryness after fermentation. Use 1.33 quarts of water per pound of grain (2.8 L/kg). Dough-in 90% of the malted grains to hit 122 °F (50 °C), and hold for 20 minutes. Mash the unmalted wheat and remaining 10% of the malted grain at 145 °F (63 °C) and hold for 15 minutes, then add the adjunct mash to the main mash. Traditionally, brewers use a multi-step mash schedule: Raise to 145 °F (63 °C) and hold for 40 minutes, then raise to 162 °F (72 °C) and hold for 30 minutes. Recently, I’ve been experimenting with a single step of about 158 °F (70 °C), to promote the formation of “unfermentable sugar” to make the yeast and bacteria work a little harder. Raise to 169 °F (76 °C), and hold for 10 minutes. When finished, sparge with 176 °F (80 °C) water. Boil for 2 hours at a rolling boil. 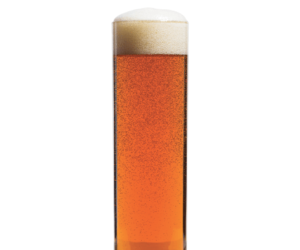 Cool the beer to 70 °F (21 °C) and pitch it with your yeast blend into a carboy. The Roeselare culture is a complete blend of all of the yeasts and bacteria necessary for fermentation. Ferment at 70 °F (21 °C). Once visible signs of fermentation have finished, rack with the equivalent of 2.0 oz. (57 g) of oak cubes for 5 gallons (19 L) into a second carboy. Put it in a corner at ambient temperature and wait (and wait). With time, a thin white film (pellicle) will form on the top of the beer. Eventually, you will sample the beer and determine that it is ready. Bottle with new yeast and your desired amount of priming sugar. As always, save me a bottle. 1.6-qt. (1.5-L) starter made with dried malt extract. Primary fermentation lasted 4 weeks. Secondary around 6 months. I added a package of Wyeast Brettanomyces lambicus culture to the secondary at around 6 months I left it in secondary for 2 more months Bottled it with 11/4 cup dried malt extract. Since I brewed the above Flemish Red, I’ve made 2 more, both in fermentation right now. I will not put them into secondary. I want the oxidation and yeast flavors to develop. I want to make the sour character as complex as I can. I am expecting two great Red ales, but will leave them both in fermentation for at least 2 years. Inspired by Rodenbach Grand Cru, New Belgium La Folie and Love, plus Pizza Port Le Woody. Formulated with help from professional brewers in America and Belgium that have experience with this style. Step mash with a rest at 122 °F (55 °C) for 20 minutes, a rest at 145 °F (63 °C) for 40 minutes and a saccrification rest at 162 °F (72 °C) for 40 minutes. Sparge with 168 °F (76 °C) water for an hour. Boil wort for 90 minutes, adding hops for final 60 minutes of boil. Pitch the yeast and bacteria pack straight into the cooled wort (no starter). Ferment in a plastic bucket for 27 days at 70 °F (21 °C), then transfer to another plastic bucket and condition beer at 70 °F (21 °C) for 5.5 months. Keg beer. 5.5 qts. (5.2 L) of water to 180 °F (82 °C). When the mash is finished, recirculate 3.0 qts. (2.8 L) of wort, then run off all of the wort. Add wort to the boiling water in your brewpot. Add 180 °F (82 °C) water to cooler until liquid is at the previous level. Stir grains, let them sit for 5 minutes, then recirculate and run off the second wort. Bring the wort — about 3.0 gallons (11 L) total — to a boil. Upon boiling, turn off the heat and stir in the wheat dried malt extract. Resume heating and return the wort to a boil. Add Mt. Hood hops and boil for 60 minutes. With 15 minutes remaining in the boil, stir in liquid malt extract. (Stir well to avoid scorching.) After boil, cool brewpot in sink (or with wort chiller) until side of brewpot is cool to the touch. Transfer wort to bucket fermenter and add cool water to make 5 gallons (19 L). Aerate wort and pitch dried yeast. Let ferment at 70 °F (21 °C). When primary fermentation slows, open bucket and pitch Lactobacillus and Pediococcus cultures. Let beer condition, in the primary bucket, for 3–4 months at 70–80 °F (21–27 °C). After this period, add Brettan-omyces culture and oak cubes, then rack beer to a glass carboy. (Soak oak cubes in beer for 2 weeks prior to adding them. If you happen to have some wine that has turned to vinegar, add a few drops to the soaking beer.) Age for another 6–9 months at 60–70 °F (16–21 °C), then keg and carbonate the beer.